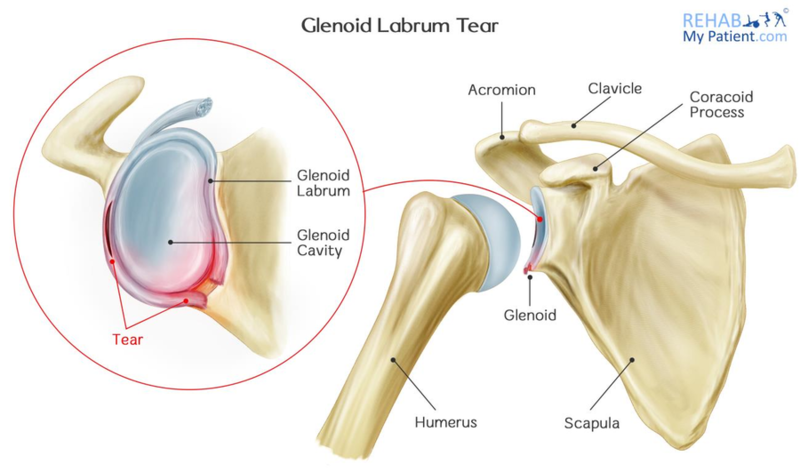 A glenoid labrum tear (known simply as a labral tear) is a tear to the edge of the shoulder socket. The structure torn is fibrous and hard, and it sits around the socket to keep the upper arm in place and to prevent dislocations. Heavy trauma to the shoulder such as falling during skiing or snowboarding, or a heavy contact during rugby or football can ram the upper arm against the socket causing a labral tear. Often the shoulder will then dislocate, or sublux (partial dislocation), which can completely detach or tear the labrum. However, some labral tears are related to overuse, and this can commonly be the case in younger athletes who do a lot of overhead throwing, or overhead sports. Tennis is a good example, where very large forces go through the shoulder repeatedly, and can cause a labral tear. Labral tears can also be degenerative, occurring in the elderly or those who have had many years of over-use to the shoulder. However, these are less likely. Diagnosing a labral tear is most often done by taking a thorough case history. If it is known that a heavy trauma has occurred, this makes it more likely that a labral tear has occurred. Also, if the patient is younger and played a competitive overhead sport, this could also be suggestive of labral tear. MRI scans can show up more severe labral tears, however, smaller Grade I labral tears are often not visible on a normal MRI. However, sometimes this can also act as a diagnosis if nothing else is shown. I.e. the MRI scan can be used to rule out other pathologies too, and if the shoulder shows a normal MRI scan yet the history suggests a labral tear, then the pathology could still be a labral tear. Elite athletes with a suspected labral tear may have an MRA (this is an MRI scan but with contrast) which shows up labral tears more clearly. However, the most accurate way to diagnose a labral tear is by looking inside. Advances in medical technology have allowed doctors to treat and identify any injuries that previously went unnoticed two decades ago. Miniaturized television cameras are now able to see inside of the joints and this is known as an arthroscopy. Thanks to this tool, surgeons are now able to identify labral tears and then repair them arthroscopically. There are three bones in the shoulder: the shoulder blade (scapula), the upper arm bone (humerus) and the collarbone (clavicle). The humeral head lies in a shallow socket within the shoulder blade, which is referred to as the glenoid. The head of your upper arm bone is often a lot larger than the socket. A soft, fibrous tissue rim, known as the labrum, surrounds the socket and helps to stabilize the joint. Thanks to this rim, the socket deepens by as much as 50 percent, which allows the head of the upper arm to fit into position better. It also serves as an attachment for a number of different ligaments. Until the doctor is able to determine a final diagnosis, you might be given a prescription of anti-inflammatory medications to help relieve symptoms. Instead of trying to move the shoulder all around, you need to give it time to rest and relax. Stop trying to play sport with it, and simply follow the rehabilitation advice from your therapist. Rehabilitation exercises in the early stages work to mobilize the shoulder and to reduce inflammation. Later, they can also help to strengthen the rotator cuff muscles. When the muscles are strengthened, they can help to withstand more of an impact or injury that comes along. During the surgery, the doctor will examine the biceps tendon and the rim. If the injury is relating to the rim itself and doesn't involve the tendon, the shoulder will still be stable. The torn flap will be removed and any other associated issues will be corrected. If the tear has gone so far as to extend into the biceps tendon or it has detached, the shoulder is rendered unstable. A surgeon will need to repair and reattach your tendon with absorbable wires, tacks or sutures. A tear below the middle part of the socket are attributed to shoulder instability. Labrums can also be detached, yet re-heal in the wrong position. If this happens, the surgeon may re-attach the labrum into the correct position. After your surgery is complete, you want to keep your shoulder in a sling for around three to four weeks on average. Gentle range-of-motion exercises are beneficial after going through surgery on the area, and can prevent frozen shoulder. Once the sling is removed, you need to perform flexibility and motion exercises more actively. After range of motion has been achieved, the stability and strengthening phase can proceed. Athletes are often able to begin partaking in any sport-specific exercises 12 weeks after the surgery, but it will take four to six months for the shoulder to heal fully.